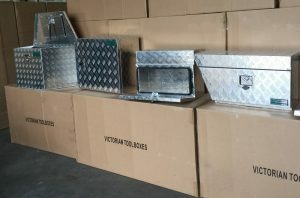 VICTORIAN TOOLBOXES is a wholly Australia owned tool box, ute tool boxes, aluminium tool boxes supplier. We supply variety of tool box, aluminium tool boxes, ute tool boxes, toolbox and accessories. Most of our aluminium tool boxes are made of 2.5 mm aluminium chequer plate. We take great pride in the tool box products and toolbox services we supply to our customers. Our tool box, aluminium tool boxes, ute tool boxes, toolbox and accessories can be delivered from our Campbellfield factory in Victoria to Australia nationwide. 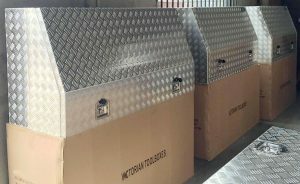 We offer Free Delivery for selected tool box to Melbourne Metro Area. 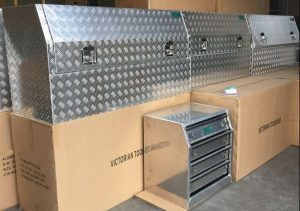 Please contact us directly on 03 9357 5865/ 03 87367704 or send us email to info@victoriantoolboxes.com.au for the freight cost and any other enquires. You can also go to our CONTACT US page on website to send your freight cost quote request and other enquires to us. We will reply back to you immediately. We continuously provide high quality tool box to suit your need. We are proud to say that a high volume of our work is from repeat customers and customer referrals.